First Communion Flyer 2014: See What the Holy Store Has to Offer! This year we’ll be distributing our very own catalog with many items that are available at the Holy Store. Because it is a lot of work, and can be expensive to have a full color catalog made up for a business, our catalog is just four pages. It wasn’t too expensive, either, because a kind Catholic printer, who desires to remain anonymous because he doesn’t want people to know how nice he is, printed it up for us. If the catalog draws in business, perhaps I can send him something to help him as he runs his business. I am sending the catalog to churches around our area, and I will also be leaving them in some businesses in Iron Mountain. You can download the catalog and look at it yourself, if you’d like. Just click on the button below. It is quite a large file, so you might have to be a bit patient to look at it. Please pray that we will have good business this spring. 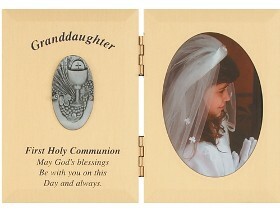 If you don’t live near Iron Mountain, you can shop for First Communion items on our website. If there is something in the catalog that you don’t find on our website, please send me an email and ask about it.